When I first saw the trailer for “Beautiful Boy” in late June 2018, I was immediately moved to tears and knew it was a story that needed to be heard. Knowing I had a good three to four months of waiting before its release, I decided to dig in to the memoirs the film is based on: “Beautiful Boy” by David Sheff and “Tweak” by Nic Sheff. Now after months of waiting, I can finally say I have seen it. To begin, I will simply say I did enjoy “Beautiful Boy.” The viewer is forced to witness the agony of a father experiencing the horror and heartbreak of his child’s addiction to crystal meth. Similar to Darren Aronofsky’s “Requiem for a Dream” in that it does not shy away from the gritty details, “Beautiful Boy” succeeds in its ability to share a more intimate tale of the interpersonal effects of addiction. The raw honesty and emotion of Nic’s own experience with addiction interspersed with his family’s experience of watching him is refreshingly real in era that seems to glamorize addiction in nearly every form of entertainment. Steve Carrell, perhaps best known for his work on “The Office,” effortlessly take on his role as the courageous patriarch of a family seemingly destined to fall victim to the disease of its eldest son. Timothée Chalamet, known for his roles in “Call Me By Your Name” and “Lady Bird,” keeps pace with the vivid characters he is so often found to play — the role as an addict. Carrell and Chalamet play their respective roles of father and son to a tee, flawlessly portraying the conflicting nature of loving and supporting someone through addiction. As someone who has read both books that inspired “Beautiful Boy,” I believe I have some insight into Nic’s life that someone who is simply receiving his story for the first time through the film may not have. This is not to say that the film is not enjoyable on its own, because it is. However, I would have enjoyed a deeper look into Nic’s upbringing and childhood. 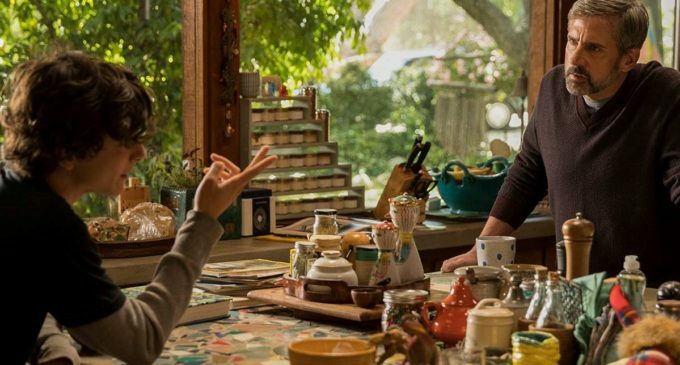 “Beautiful Boy” would have benefited from a more complete retelling of Nic’s struggles with his parents’ divorce rather than just sporadic flashbacks to his adolescence and emotional goodbyes with his father. Though these flashbacks do serve their purpose, it is through their juxtaposition with Nic’s later struggles that the viewer is able to experience a deeper sense of David Sheff’s agony in watching his beautiful boy fall victim to addiction. Additionally, I would have liked to see mental health discussed to some degree and how that undoubtedly played a hand in Nic’s disease. The inner turmoil Nic experiences as a loving son, brother and addict will make the viewer question just how and when the trajectory of his life took the turn it did. I do realize that everything — or even a fraction of everything — from the books could not have possibly made it in to the movie or else it would have gone well beyond its two-hour runtime. That being said, director Felix Van Groeningen did an outstanding job of sharing the Sheff’s story in the allotted time. Whether you or someone you know has dealt with addiction or not, “Beautiful Boy” will resonate with viewers because of its unflinchingly real portrayal of how addiction not only effects the addicted themselves but the people closest to them as well. Though various scenes throughout the film were hard to watch, there were also some very beautiful, touching scenes serving as a break from all of the turmoil and anxiety. Despite feeling a bit unfulfilled, I did enjoy “Beautiful Boy” and believe it is a story and a film worth experiencing.